The Contoured Foam Roller can be used on both large and small muscle groups to increase flexibility and loosen tight muscles. This roller has a hollow center with a thin rigid outer layer. This design, along with a ridged surface, allows the user to have a more deep and aggressive massage. Each roller is 5.5" X 13"
The Contoured Foam Roller has rigid bumps on the surface for a deep tissue massage. 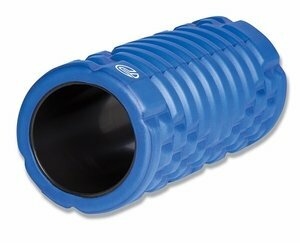 This roller can be used to increase flexibility and loosen tight muscles. The roller has a hollow center. Contoured roller measures at 5.5" X 13"